Hednesford Town comfortably negotiated their passage through to the First Round proper of the FA Trophy as Rob Smith’s side shook off defeat against Crawley Town in the FA Cup last week. The Keys Park outfit, such proud ambassadors for non-league football against the League One side, barely moved out of second gear against a Workington AFC side who, had they finished with as much skill as their hosts, could have made the game a lot less comfortable than it was. Elliott Durrell tested Joel Dixon twice in the opening five minutes with a teasing cross and then a shot hit straight at the goalkeeper but it was the away side who had the best early chance when Lee Andrews skipped down the right wing and crossed for Josef Jackson, unmarked at the back post, who headed tamely over the bar from six yards. The Pitmen heeded that early warning but with a somewhat flat atmosphere inside Keys Park only raised themselves on 27 minutes when Wayne Riley smartly controlled a long ball and finished confidently in off the post past the goalkeeper to open the scoring. The opening goal seemed to spring Hednesford into life and within three minutes they doubled their advantage when Durrell found space on the right wing and sent in a superb cross to which Francino Francis got the slightest touch to divert the ball into the far corner. Workington had another golden opportunity on 34 minutes when Ross Wilson was found by a through ball clear inside the Hednesford area but hit his shot against the inside of the post and the ball bounced clear. Man of the match Kris Taylor, a metronome-like presence in the centre of midfield, forced Dixon into a sprawling save from long distance after the break and then, worryingly for Hednesford, ahead of next week’s top of the table clash against Brackley, Jamey Osborne came off with what looked like a side injury. The Pitmen then wrapped up the victory with a bizarre goal when the referee awarded an indirect free kick which was debated strongly by Workington. Durrell ignored the protestations and slammed the ball into the far corner only for the ball to break the net and flummox those behind the goal who were fooled, thinking the ball must have gone wide. 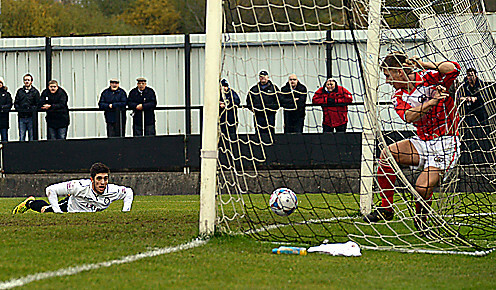 The goal was rightly awarded but Workington still had time to waste a further two chances in the final minutes as Josef Jackson hit the ball against Francis when it looked easier to score and John Disney hacked a shot clear of the line but Hednesford now safely take their place in the next round.